The above book is written in German and is written by Monsignor Karlheinz Knebel,Vicar General of the Diocese of Augsburg,when he was Parish Priest of Füssen and Regional Dean.He has a great love and respect for Blessed Francis Xavier Seelos.Like the Blessed,Monsignor was born and baptised in Füssen. 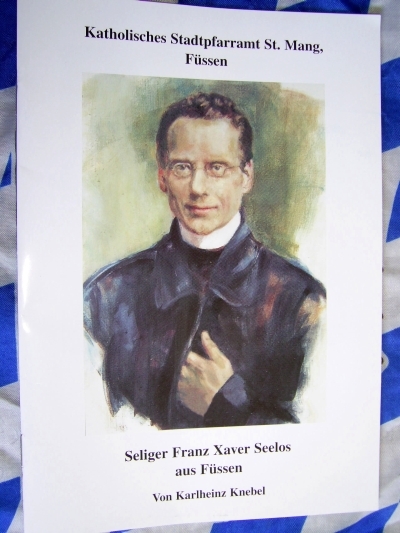 The book is very similar to the information found in the English "A Life of Blessed Francis Xavier Seelos.If you are able to read German it is well worth buying a copy when you visit the Shrine of the Blessed here in Füssen. This is an interesting book aimed at bringing Blessed Seelos to children.It mixes fact and fiction to tell the story about a young boy called Willy who sets off to find his brother who is fighting in the American Civil War.Our children enjoyed the story basis where Willy has many adventures and meets many people trying to find his brother.One of the people he meets is Blessed Seelos.The problem our children had was with all the information about battles in the American Civil War.The author seems to be a bit of historian and put many many details and battles in the book adding an accurate historical account of the war.Our children who are not American did not understand this at all and much of the story lost them.For American children the book will be easier to understand.despite this struggling with American history,the children enjoyed the story and were taught a lot about who Blessed Seelos was despite the fact Willy's character is completely fictitious.It belongs to the "Glory of America" series of books.These try to bring American saints lives into the hearts and minds of children.We recommend this book for all children wanting to know something about this wonderful priest who became a Blessed April 9th 2000. An excellent book for those wanting to know the life story of Blessed Francis Xavier Seelos from his birth in Füssen until his death in New Orleans from Yellow Fever.Once I had started to read this book it was very difficult to put it down.Father Hoegerl is a marvel with languages and he has fully researched the life of Blessed Seelos and is largely responsible for his beatification.He has searched archives in Füssen,New Orleans and other places where Blessed Seelos served and brings the Blessed to life. This book is a must for any lover of Blessed Seelos. If you have ever come in contact with YELLOW FEVER you would know the heroic suffering the priest who served on the Mission in New Orleans went through. Father Byron Miller brings you extracts from many sources that show the sanctity not only of Blessed Francis Xavier Seelos,but also the faith and love of God which drove the other Redemptorist Missionary Priests and Brothers to die in service of Our Blessed Lord and their Fellow Men.This book is a must for anyone wanting to deepen their faith and learn the meaning of sacrifice for the sake of God and others in His name. 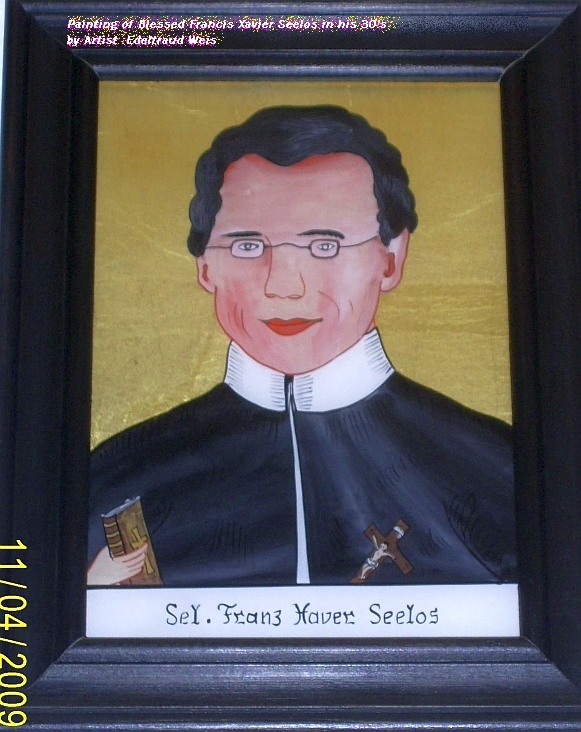 "Novena in Honor of Blessed Francis Xavier Seelos" by Father Byron Miller,C.Ss.R. This is really a book worth purchasing and saying the Novena.My wife picked up this book as she was in need of work.Not only did she find work in translating a religious book from English to German,but she decided that she needed to go to Mass more often.She now goes twice in the week which can be difficult with 6 children and all that implies.She now says the Novena continuously for different needs in our family and in the world.Blessed Francis Xavier Seelos has helped to gain God's grace for her and her petitions,He will surely do it for you as well. 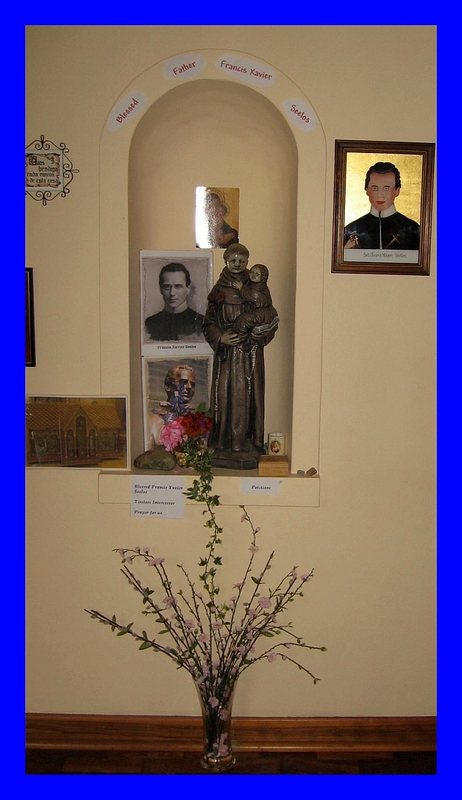 "Cheerful Ascetic" The Life of Francis Xavier Seelos.CSs.R by Father Michael J.Curley. CSs.R. This book can be hard going.It is really worth reading through as it contains information about Blessed Seelos not found in any of the other books on his life.Father Curley has really researched his subject.He also takes half the book up with references.You could be tempted to skip the references,but beware you will miss vital info information about him if you do.Father Curley has a style of writing that interjects his own thoughts on certain events in the life of Blessed Seelos,where Seelos comes under attack from others.I personally found this off-putting,as I feel that a life of a saint should be that without personal intervention.This intervention tended to make the book harder to read as it exstended attacks against Seelos and broke the flow of the book.This said this book is a mine of information and a treasure chest that opens the life os Blessed Seelos completely to us al.Warts and all as they say.Any serious lover of Blessed Seelos is going to want this book in their collection for reference and spiritual meditation. "Sincerely Seelos" The collected letters of Blessed Francis Xavier Seelos Edited by Carl Hoegerl,C.SS.R. This book is full of the spirit of Blessed Francis Xavier Seelos.His letters are an eye opener to the deep spirituality and humbleness of this man of God.His whole life revolved around Our Blessed Lord and His Beloved Mother,Mary.Personal letters to his family,students,other priests,sisters and to others who asked his spiritual help,shows a deep insite into a Priest who gave all for His Saviour.All was for Him.Every good things,every suffering,all could be used to glorify God.The only thing that mattered in this life was to do His will and do it with trust,love and a cheerful heart.The letter breath forth the life that he had with God.He consoled others and helped then with his advice and prayers.Blessed Seelos has a personal relationship with God that draws others to him so as to come closer to God themselves.The letters show the great love he had for his family.The family he willingly left to go to the otherside of the world to minister to his countrymen in America who were desperatly short of priests to care for their spiritual needs.Blessed Seelos never forgot his family in Füssen and always wrote and told them what he was doing,asking their prayers and encouraging them to greater holiness in their lives.His letter show understanding and a compassionate heart which had only one goal-bringing souls to Christ.This book is highly recommended.We did notice a couple of mistakes in the book which we have brought to the attention of the Redemptorist Order who publish the book.On page 28 a painitng of Füssen showing the Hohes Schloss (High Castle is wrongly anotated as being Neuschwanstein Castle which is 3 kilometres away in Schwangau.Also we pointed out that the painting which is taken from an area near the Franciscan Church is of the post-secularisation period as the artist has deliberatly missed St Mang Basilica and the former Benedictine Monastory attached to it,out of the painting.It would be impossible not to see these to buildings at that time.This can only lead to the assumption that the seculalists like the communist many years later like to rewriet history or as in this case,get rid of two large religious buildings from the skyline! On page 69 Blessed Seelos in a letter to his sister asks her to go to "Our Lady of the Mountain" and pray for him.The book gives in the notes that this refers to a shrine outside of Füssen.It in fact refers to a church within Füssen called the "Frau am Berg Kirche".It is on the road to Austria and is now used for Mass 3 or 4 times a year. Hopefully it will soon be published in other languages so many more people worldwide can experience his love of God and by reading it and meditation on the contents be drawn closer to the Saviour of the World whom Blessed Seelos served. A 68 minute film about the life of Blessed Francis Xavier Seelos from his birth in Füssen,Germany until his death in New Orleans USA 48 years later.The film is great although we personally did not like the use of an actor to portray Father Seelos.We felt that it lost the sence of his spirituality.That said this is a riviting film and when our copy of the DVD entered Wales it impressed a convent of enclosed religious sisters of the Poor Clare Colettine order based in Wales so much that they did this! Bob & Penny Lord run a worldwide Ministry of evangelisation through communications.They love to take others on "Journeys of Faith".They recently visited the Blessed Seelos Shrine and Center in New Orleans.This DVD shows us the Shrine of Blessed Seelos,interviews with Father Byron Miller,Executive Director of the Seelos Shrine as well as a few believers who claim to have been healed through the intercession of Blessed Seelos.It lasts 1 hour and is packed with hard hitting facts about Blessed Seelos. It takes a little while to get used to Bob & Penny's style if you have never seen them before.They came across as very friendly and very commited and after about 5 minutes one felt very close to them.Father Byron looked very nervous at times during this video. Having seen him interviewed a few times on Catholic Television stations he seemed more natural in this DVD and one could see the commitment and love he has for promotion of the Canonisation cause of Blessed Seelos.The whole DVD is well worth watching and very enlightening.However we were very disappointed that the pronouciation of the town where Blessed Seelos was born is always incorrectly pronouned FOOSEN not Füssen. Living here in Bavaria and in the city where Blessed Seelos was born it was sad to see that a photo of a church which we are led to believe is in Füssen is actually St Colomans Church,Schwangau which is 3 kilometres away and not part of the Parish of Füssen.In the whole of the section talking about Seelos's beloved Bavaria not one photograph or video scene shows Füssen where he spent the first 13 years of his life! Apart from these small hiccups the DVD shows why so many come to New Orleans to ask Father Seelos to intercede for their healing.Bob & Penny hit it on the head when the say what an excelent example he is for all priests.They specifically show how important was his ministry in the confessional and we are shown even today lines of people queing up outside the confessional prior to a Seelos Healing Mass which takes place three times yearly.The DVD is priced at $19-95 which compared with other DVD's seems expensive,but this DVD is special because of the Spiritual content within and this makes it well worth the price.It contains some scenes which are exclusive so I will not spoil it by telling you.Anyone wanting to know more about Blessed Seelos is recommended to buy this DVD. The DVD is on the Left Hand side of the page. The Life & Labors of Blessed Francis Xavier Seelos in Maryland's Allengheny Mountains,1857-1865 by Father Blaine Burkey O.F.M.Cap. Dispite having read much of the information in this book in other books about Blessed Seelos,I found the style and enthusiasm of the author compelling.What struck me first was the distintive paperback cover.It gives you immediatly the feel of an old book and has a photo of Cumberland with the Church and monastory in the centre.Another plus about the book is the size of the text.That and the rhymthmic style of the author brought the years spent in the Cumberland area vividly to life. "St Mary's Church in Annapolis,Maryland. 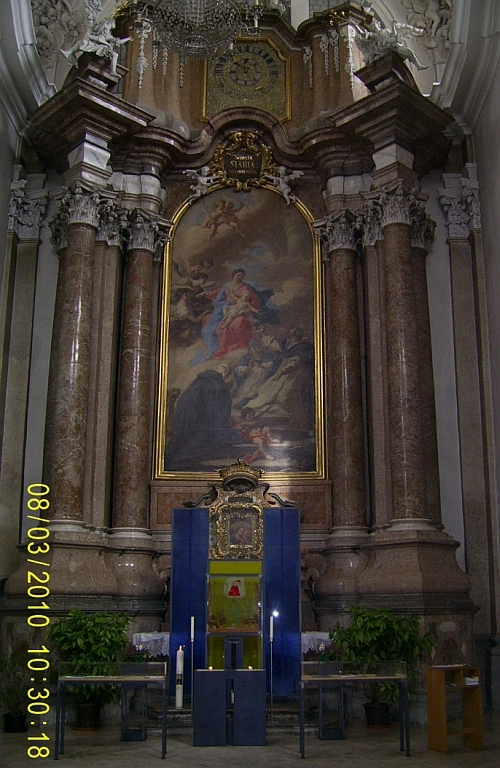 In his book he gathers all available data on the times that Blessed Seelos spent there in his ministry.It is of great importance to Füssen as Blessed Seelos was born,Baptised,Confirmed,made his 1st confession and communion here as well as serving daily Mass. 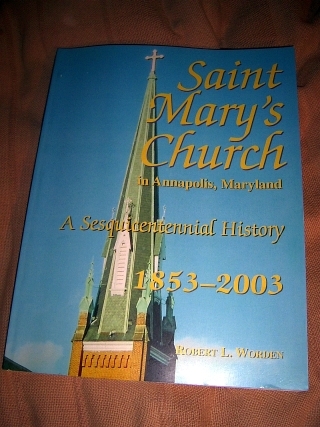 Dr Robert Worden has been archivist and historian at St Mary's since 1982.He gained a PhD at Georgetown University in 1972.He has lived in Annapolis since 1971. Father John Kingsbury CSsR,Parish Priest of St Mary's,told us "He is our parish archivist but it is a labor of love and he is not on our paid staff." The pages devoted to Blessed Seelos within this book show details about his life in the Parish.It is worth any real Seelos lover purchasing this book to have in their collecting.